an hour of balancing, teamwork, and fun. 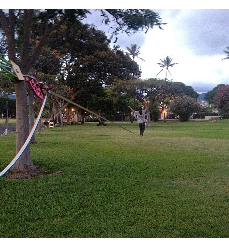 All slacklines are setup for you, and there will be instructors guiding the class. The class starts off with specific yoga poses on the floor. These are poses that build a foundation in balance that you will be needing very soon! These poses are then applied to the slackline. After everyone is feeling comfortable, we break off into groups and begin walking. The rest of the class focuses on walking or practicing poses. 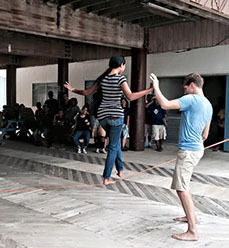 By the end, everyone will feel comfortable on a slackline, and have learned enough technique to be able to do yoga poses on a slackline – if not walk all the way across! For a more experienced or technically minded group, we recommend the Slacking 101 class. We go over the same poses and techniques as the Slackfun, but with the addition of more transitions. 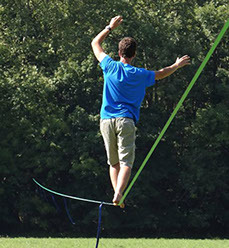 There is also an extra section of the class focused on safety and slackline set-up. 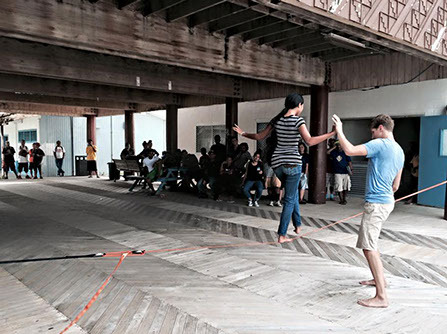 Everyone will walk off with an understanding of slackline setup, rigging, mechanical advantage, and of course being able to do yoga on a slackline, if not walk across. 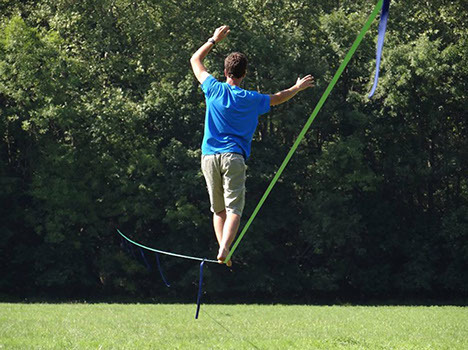 This class is more technique based, and cover advanced moves for experienced slackliners. Please call us for information. A vast valley, wind rustling through your whole body. You look down, and see nothing but the line. Despite your fear – you take a step into the void. That’s not really what happens when you’re slacklining, but for a lot of people it might feel that way. 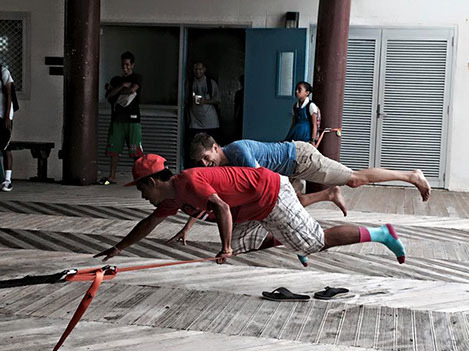 Our classes are aimed at making you feel comfortable on a slackline. 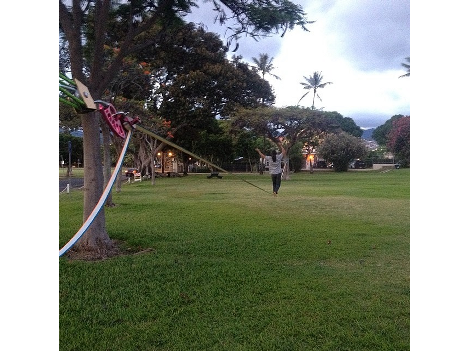 Learning to breathe, focus, and walk on a slackline builds skills that apply to every aspect of life. 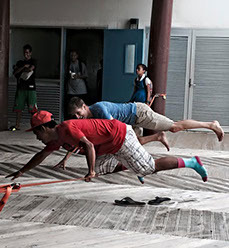 We guarantee you’ll finish our classes with the ability to walk ( slackline or not) with confidence. Our Rock Climbing School offers a range of classes for people who have never been rock climbing to trad gurus looking for a refresher. Looking to get out of the office?Demonstrate the importance of leadership skills and teamwork in a not-so-typical work environment. Our kids program is here to motivate kids to not only play in our environment, but also take care of it.